On the heels of a wonderful Thanksgiving weekend, I have to post about two unexpected blessings I received recently. A little over a month ago I had a ticket to an event that I was not going to be able to use. The ticket was paid for long ago and when I discovered I couldn't go it was far too late for a refund. I offered the ticket up to a fantastic group of women and Andrea Updyke of Lil-Kid-Things was able to take advantage of it. I was so glad the ticket wasn't going to be wasted. Fast forward to Monday, November 14th. I was frantically trying to get my life in order before my mom had surgery on the 15th. I was in a horrible mood because there was no way I was going to get everything done that I wanted to. I am my own worst enemy sometimes. I was on the verge of falling apart when I brought my kids home from school. The house was a mess, there was laundry to do, and I hadn't planned anything for dinner. Just when I was ready to scream, the UPS driver showed up. A small box was deposited on my front porch. A small box from the Disney Store (even better!) Inside that little pixie-dusted box? 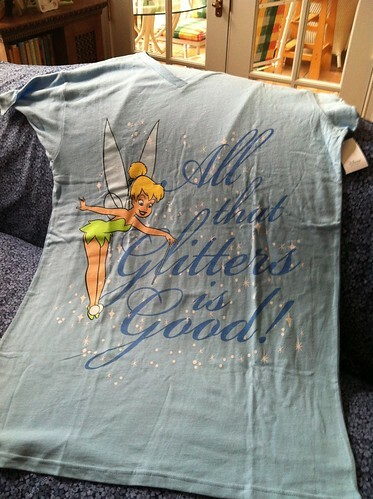 Andrea sent me this fabulous Tinkerbell Sleep T-Shirt! It was completely unexpected and so fantastic. It's even sparkly! I know it's a small thing, but small things have the power to completely change your perspective. I so needed that splash of fun on that day. It was also a powerful reminder that when you put good into the world, good is what comes back to you! Thank you, Andrea! Fast forward again to the week before Thanksgiving. Mom's surgery was successful and she has been recovering well. She was and is still restricted on lifting and driving so I was trying to help get everything ready for Thanksgiving. My house was still a mess (surprise,) laundry still needed to be done, but I had planned some of what I was fixing. My sister, my sister-in-law, and I were fixing the various dishes for our traditional Thanksgiving dinner. I had decided I wanted to make a cheese spread to have around during the weekend. We had a delicious spread for an open house at work recently so I asked for the recipe. Instead of emailing or dropping off the recipe, my friend dropped this off at work for me. 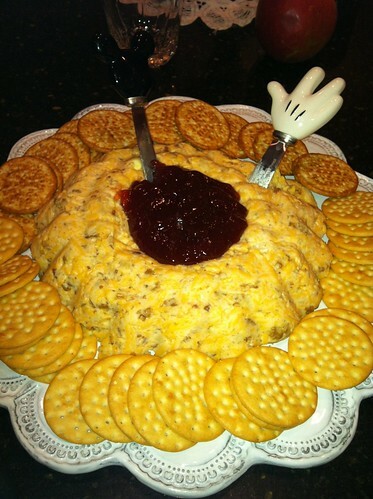 In the midst of my craziness, it was such a blessing to have this cheese spread just magically appear. The friend responsible (you know who you are) added a moment of peace to my life. She put love out into the world. Now I get to figure out how to pay it back AND pass it on. I hope during the upcoming holiday madness that you are on the receiving end of unexpected blessings, and I hope you are able to pass them on.